A Notification No. 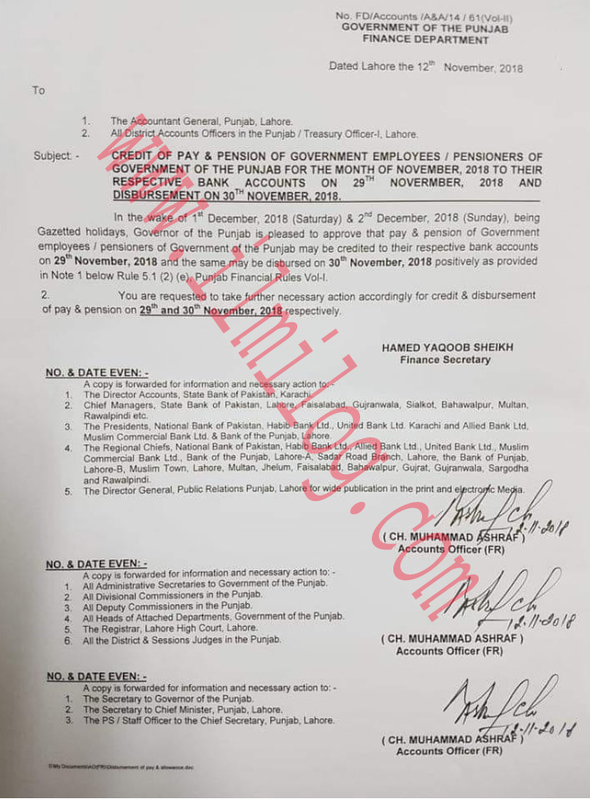 FO/Accounts/A&A/14/61(Vol-II) government of the Punjab finance department Dated Lahore the 12th November 2018 regarding Pension plan & Salary Guide for Employees Finance Department. 1. The Accountant General, Punjab Lahore. 2. 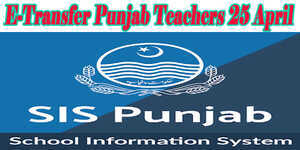 All-District Accounts Officers in the Punjab / Treasury Officer-I. Lahore. Subject - CREDIT OF PAY & PENSION OF GOVERNMENT EMPLOYEES / PENSIONERS OF GOVERNMENT OF PUNJAB FOR THE MONTH OF NOVEMBER, 2018 TO THEIR RESPECTIVE BANK ACCOUNTS ON 29 NOVEMBER. 2018 AND DISBURSEMENT ON 30 NOVEMBER 2018. In the wake of 1st December 2018 (Saturday) & 2nd December 2018 (Sunday) being Gazetted holidays. Governor of Punjab is pleased to approve that pay & pension of Government employees/pensioners of Government of Punjab may be credited to their respective bank accounts on 29th November 2018 and the same may be disbursed on 30th November 2018 positively as provided in Note 1 below Rule 5.1 (2) (e). Punjab Financial Rules Vol-II. 2. You are requested to take further necessary action accordingly for credit 8 disbursement of pay 8 pension on 29th and 30th November. 2018 respectively. No. And DATE EVEN: -A copy is forwarded for information and necessary action to '-1. The secretary to Governor of the Punjab 2. - The secretary to Chief Minister, Punjab. Lahore. 3. The PS / Staff Officer to the Chief Secretary. Punjab. Lahore.